Northern Lights is a sought-after complex just above the top of Whistler village. If offers spacious homes with high ceilings, plentiful windows with lots of natural light, a short walk down to the village and the lifts and the ability to hike directly to the ski trail. Unit 21 is a new renovated 3 bedroom plus den end-unit townhome located right next to the steps which lead up to the ski trail. 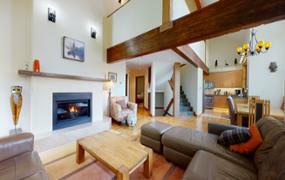 Entry is on the ground floor, which has a double garage and storage room for skis, boot and outerwear. Slate-tiled stairs lead up from here to the main level, which offer a spacious living and dining area and a large kitchen with granite countertops and cherry cabinetry. This level also features a den with sofabed and LCD TV and the third bedroom which has a double plus a twin bed. These two sleeping areas share a full bathroom. There is also a spacious deck with private hot tub. The second floor has two master bedrooms with ensuite bathrooms, one with a king bed and the second with a king or 2 twins. This would be an ideal choice of Whistler accommodation for a group looking for a spacious and comfortable home with easy walking access to the village and the option of hiking directly to the ski run.